Fons appointments are super flexible and easy to change the following date & time, duration, cost / price, staff member, add or delete attendants, and More. Cancel - Click on the "Cancel" button. If it is a recurring appointment you can cancel the entire series or just the one. Once you click cancel you can add an optional note and it will notify your client via email and within the notification bell in the app. Date, Duration or Reschedule - Click on the "Reschedule" button to change any of these options. If it is a recurring series you can only reschedule the one appointment. This will email your client to let them know if any of these changes have occurred. They DO NOT have to reconfirm the appointment, just cancel if it doesn't suit them. Cost - Click on the "change" button under the cost section. You can change the cost of just this appointment or the entire series. If you change the cost it will email you client and they will have to reconfirm the appointment or series. Staff - If you have staff members and you change to another member, it will email the staff member that the appointment has been changed to. It does not notify the previews staff member of the change nor the client. Group Appointments - Use the "manage attendees" button to add and remove clients to the appointment. If you add a client it will notify them to confirm via email and the notification bell in the app, however if you remove them it will only remove them with no notifications. 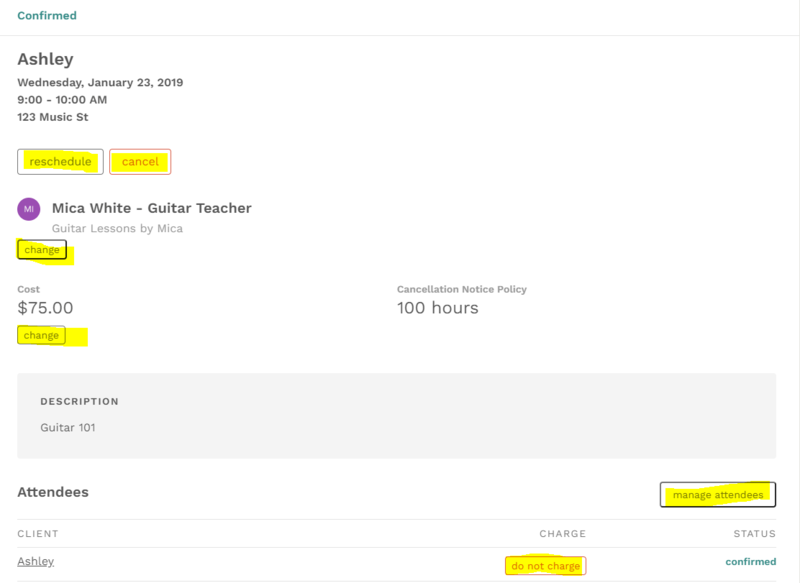 If your client has a subscription or package in place the group lesson price will override those and charge your client, if you would like not to charge them see, below. Do Not Charge - Click on the "do not charge" button if you would like to not charge that client. It will only not charge them for this appointment and does not affect the series. If you choose not to charge it will notify your client via email.